The older adults in our lives have done so much for us. Whether they’re parents, neighbors or other loved ones, their guidance and experience has no doubt made our lives immeasurably better. That’s part of the reason why dementia is such a tragic and saddening illness to watch. It is painful to witness the people we love and respect as they slowly deteriorate before our eyes. Because of that great sadness, it’s easy to overlook the other costs associated with caring for dementia sufferers. In fact, a new report by the Alzheimer’s Association shows that 20% of caregivers are going hungry due to the unexpected costs of providing care. It’s a sobering finding, and it’s one that bears careful consideration. Planning won’t prevent these costs, but it can help to mitigate them. Even if you can’t change the financial reality, planning can help prevent much of the stress associated with a dementia diagnosis. Much of the fear surrounding a medical crisis like this is due to a lack of certainty. Having a financial plan in place can provide a bedrock toward providing some certainty. No matter what else happens, you know how you’ll solve the financial issues that result. There are quite a few variables to consider in making a financial plan to provide care for an older adult who is coping with dementia. Sitting down with a piece of paper and trying to write it out can seem overwhelming. Before you give up, though, consider these three suggestions. Don’t shoulder the burden of financial planning for elder care by yourself. Family and friends will be there to support you. Even if you expect to take on most of the costs yourself, invite others to take part in the planning. Getting others involved in the planning process can help identify missing components or overlooked costs. Having others involved in the planning process can also encourage them to participate in caregiving that will be needed down the road. Better still; involve the older adult in discussions about her or his care. Only he or she can answer questions about quality of life, care preferences, institution choices and many other factors. No one wants to have these conversations, but it’s better to have them with your full faculties than be the subject of the conversation without them. Inviting the older adult to the conversation can also be a chance to talk about financial matters. Dementia can limit a person’s capacity to discuss their financial status, so financial planning is best done while still early in the process. Seniors may have money saved in HSAs or FSAs that can be used exclusively for medical care. Using that money to help defray the costs of care can make smart tax and estate planning sense. More than a third of caregivers in the Alzheimer’s Association survey cut back their work commitments or quit their jobs to provide care for an ill older adult. Part of your plan should include a way to share the time commitment that is involved in providing that care, balancing the needs for “on-call” care and day-to-day assistance. It’s important to find a way to share this workload fairly between caregivers. Making the decision with little notice can add resentment and frustration to the already stressful job of caregiving. If one member of the family feels like they were forced to sacrifice their future or career unfairly, that feeling may lead to serious conflicts down the road. Alzheimer’s patients can survive for quite a long time, and may require more care as the disease progresses. 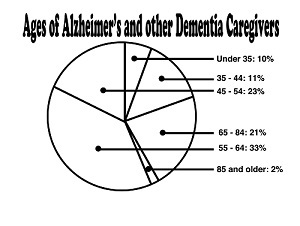 The long-term survival rate for those diagnosed with Alzheimer’s is as much as 20 years. That can be quite a lot of care to plan and deliver. While the loss of income can be difficult to bear, it can often be beneficial. In-home nursing care for an 8-hour per day shift can cost $22,000 per year. Cutting hours at a minimum wage job rather than paying for that nursing care could work out well for the family in the long run. For most medical expenses, people expect insurance to foot the bill. Since Alzheimer’s is typically not diagnosed until age 65 or older, most sufferers have Medicare coverage. While many of the costs associated with the disease are covered by Medicare, quite a few large expenses are not. Doctor’s visits, medication and some rehabilitation or occupational therapy are covered by Medicare, but in-home nursing care and nursing home care are not. These two costs can rapidly eclipse even a respectable salary. One month of residential care costs, on average, $6,235! That’s more than $72,000 per year. This expense, if unplanned, can easily wipe out savings and leave an entire family deep in debt. For people who have spent all or almost all of their savings, Medicaid may pick up the bill. However, this program will take effect only for people of very low or no incomes and shouldn’t be considered as a first choice. Supplemental insurance specifically for long-term nursing care can be an attractive option for many older adults. Typical costs run between $1,000 and $3,000 a year in premiums. Policies typically provide a maximum per-day benefit. They won’t cover the entire cost of a nursing home stay, but can significantly mitigate them. Alzheimer’s is a scary disease. The symptoms are serious and frightening, and the progression of the disease is wildly unpredictable. With all of those concerns, it can be easy to overlook the financial costs. Early planning can help reduce the worries associated with an Alzheimer’s diagnosis, and ensure you and your family can focus on supporting each other during the difficult times ahead.